Cat litter may not be the first thing that comes to mind when you think about being kind to the environment, but like so many other purchasing choices, you can make a difference with the type of litter you and your cats use. Our friends over at Petcentric posted this Earth Day article about some of the great natural litter options available, like paper pellet litter made from recycled newspapers (called, appropriately, Yesterday’s News) and a clumping cat litter like Pure Nature made from cedar, pine and corn. You can also make a difference with how you dispose of your used litter too. Paper litter like Yesterday’s News is biodegradable, especially if you use large brown paper lunch bags to collect and dispose of it. 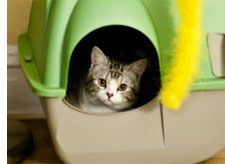 It’s also virtually dust free, scent free, and safe for kittens and post-surgical cats. Many natural litters are certified safe for septic and sewers too, so you can flush them. Cats can be finicky about what type of litter they prefer, so follow our steps to switching cat litter safely and slowly. You can make earth-friendly decisions even with your cat litter! Did you like this article? Click an icon below to share it on Facebook, Twitter, and more!